The release of this album is a big moment for The Other Guys. The duo have dedicated the last few years to independently releasing projects that remained true to the classic, boom bap hip-hop sound. I remember being caught completely off guard the first time that I heard their music. They stood out because nobody was making music like they were. Their sound wasn’t old or dated in any way, they just had a completely sincere approach to creating a style of hip-hop that was falling to the wayside for more convenient methods of modern production techniques. With each mixtape release, The Other Guys earned more and more attention from rappers who can truly be considered taste-makers. They managed to get Tanya Morgan, yU, and Substantial on Seeds of Ambition. If pulling in respected lyricists like that isn’t a sign of accomplishment, then I don’t know what is. Right from the beginning of the album, The Other Guys are making a statement. 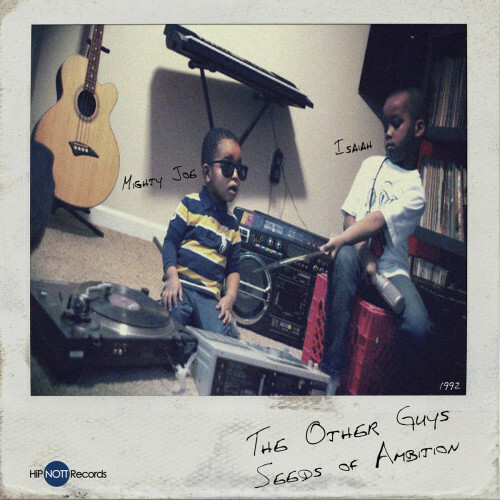 They kick off Seeds of Ambition with a De La Soul sample that says it all, “Be some brothers from the east with them beats that be thorough.” It’s a bold move, using a classic like Stakes is High, to back up your claim that you should rightfully be making hip-hop and that you’re good enough to compare yourselves to the likes of De La Soul. I’m not saying that’s exactly what The Other Guys are doing here. That’s just how it comes off. And it works. The dirty instrumental matched with the vocal sample automatically gets your head nodding. Listeners unfamiliar with the duo will find recognition that they can grasp onto and stick with throughout the remainder of the album. Mighty Joe’s production throughout Seeds of Ambition is proof that he’s on top of his game. Leaving no record unturned, each beat has been fitted with a perfect sample and a nice rhythm. The outcome has the instrumentals sounding effortless and precise. They’re the perfect groundwork for Isaiah to come in and do his job – rap. And rap he does well. Isaiah isn’t one for gimmick’s like catch phrases or sound effects. He’s all about the flow. Rhymes after rhymes comprised of smart, thoughtful lyrics float along with the production. The quality is continuous throughout the entire album, beckoning repeated listens. Trust me, you will repeatedly comeback and listen to this album. The Other Guys are dedicated to crafting good hip-hop and they’re succeeding. Seeds of Ambition is out now through HiPNOTT Records. Get it HERE.